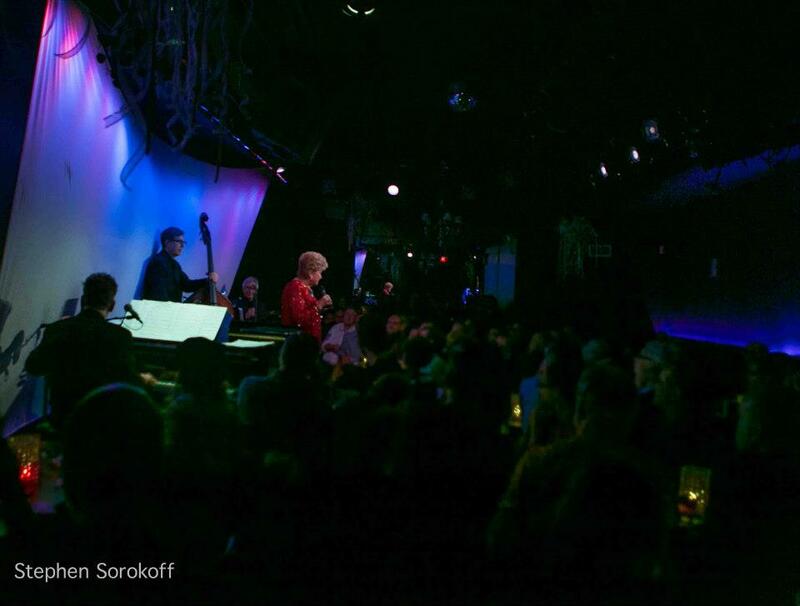 (L-R) Billy Stritch piano, Tom Hubbard bass, Warren Odze drums, Marily Maye in red, and her rapt Metropolitan Room crowd. Image by Stephen Sorokoff. The place is packed, the celebrity sightings are rich (from Jamie deRoy to Caroline O’Connor to Jim Caruso in my particular audience), and the energy high. In what has become an annual engagement of several nights in early January to follow up her New Year’s Eve engagement in this intimate venue, Marilyn Maye swoops onto the Metropolitan Room stage with three musicians, sells the tunes (straight no chaser), works up to a few high kicks as late-set lyric punctuation, and touches her audience in voice, in story, with hands, with sentiment. She is a wonder. I’m here for the first night of the post-New Year’s engagement. Some tunes are being tweaked on the fly, or entertainingly scripted to appear as though this is the case. The first eight or so tunes are indeed tunes that this audience had requested before hand. (The routine is that you provide your request or requests by phone or on line when you make your reservations.) Among the requests are “I Hear Music,” “It’s a Most Unusual Day,” “I Can’t Give You Anything But Love,” and the Sondheim tune “Old Friends,” from Merrily We Roll Along. She and her combo (the delectable and newly svelte Billy Stritch on piano, occasionally smiling and bottom line bassist Tom Hubbard, and solid rhythm-man Warren Odze on drums) present surprising arrangements of individual and sometimes stunning mashups of tunes. “Look to the Rainbow” merges into “Over the Rainbow” and then into “The Rainbow Connection.” Muppets to moppets to Sondheim to Arlen. “I’ll Take Romance” edges into “My Romance” — an evening highlight. Right along this time in the evening of handcrafted new lyrics she has been occasionally reading and trying out on us, she stops in time before she stops our hearts. “I’ve recorded this, I know this” she says before lighting into a delicious version of “Too Late Now”, written for Judy Garland and a film she ultimately didn’t complete (Royal Wedding), a tune she ultimately gave luscious life on the first recorded episode of her 1963-64 CBS television series, and a tune which Jessie Mueller broke hearts and stopped the show singing in the revamped On A Clear Day last season — “Too Late Now.” Marilyn makes even this tune with that pedigree all her own. “Day In / Day Out” and “Come Rain or Come Shine” add to the standards she often presents, and each journey through each story is worth the ride. “Guess Who I Saw Today” – – a story tune if ever there was one, of a women talking to her husband reporting where and with whom she spied husband earlier that day. Breaking your heart once, she follows that up with the next part of the story. “This is the same lady about three months later,” Maye quips, and lights into Billy Barnes‘ moving tune of a female bar fly wishing for “Something Cool.” A New York medley impresses me. “New York, New York” from On the Town and Liza’s anthem “The Theme from New York, New York” (“start singing the blues”) and “I Happen to Like New York.” And amidst other gems, she concludes with “The Best of Times is Now” edging into “It’s Today” and we’re laughing and crying and clapping so hard our hands hurt. One more performance of this engagement at the Metropolitan Room. If you miss her there you can catch Ms. Maye as part of the “all performance award show” 11th Annual Nightlife Awards at Town Hall on January 14th. Because, people, we have to honor the artform and besides — it’s a grand time.